Peter Ware Higgs CH FRS FRSE (born 29 May 1929) is a British theoretical physicist, emeritus professor at the University of Edinburgh, and Nobel Prize laureate for his work on the mass of subatomic particles. In the 1960s, he proposed that broken symmetry in electroweak theory could explain the origin of mass of elementary particles in general and of the W and Z bosons in particular. This so-called Higgs mechanism, which was proposed by several physicists besides Higgs at about the same time, predicts the existence of a new particle, the Higgs boson, the detection of which became one of the great goals of physics. CERN announced on 4 July 2012 that they had experimentally established the existence of a Higgs-like boson, but that further work would be needed to analyse its properties and see whether it had the properties expected from the Standard Model Higgs boson. On 14 March 2013, the newly discovered particle was tentatively confirmed to be + parity and zero spin, two fundamental criteria of a Higgs boson, making it the first known fundamental scalar particle to be discovered in nature. The Higgs mechanism is generally accepted as an important ingredient in the Standard Model of particle physics, without which certain particles would have no mass. Higgs has been honoured with a number of awards in recognition of his work, including the 1981 Hughes Medal from the Royal Society; the 1984 Rutherford Medal from the Institute of Physics; the 1997 Dirac Medal and Prize for outstanding contributions to theoretical physics from the Institute of Physics; the 1997 High Energy and Particle Physics Prize by the European Physical Society; the 2004 Wolf Prize in Physics; the 2009 Oskar Klein Memorial Lecture medal from the Royal Swedish Academy of Sciences; the 2010 American Physical Society J. J. Sakurai Prize for Theoretical Particle Physics; and a unique Higgs Medal from the Royal Society of Edinburgh in 2012. The discovery of the Higgs boson prompted fellow physicist Stephen Hawking to note that he thought that Higgs should receive the Nobel Prize in Physics for his work, which he finally did, shared with François Englert in 2013. Higgs was appointed to the Order of the Companions of Honour in the 2013 New Year Honours and in 2015 the Royal Society awarded him the Copley Medal, the world's oldest scientific prize. Higgs was born in the Elswick district of Newcastle upon Tyne, England, to an English father and Scottish mother. His father worked as a sound engineer for the BBC, and as a result of childhood asthma, together with the family moving around because of his father's job and later World War II, Higgs missed some early schooling and was taught at home. When his father relocated to Bedford, Higgs stayed behind with his mother in Bristol, and was largely raised there. He attended Cotham Grammar School in Bristol from 1941–46, where he was inspired by the work of one of the school's alumni, Paul Dirac, a founder of the field of quantum mechanics. In 1946, at the age of 17, Higgs moved to City of London School, where he specialized in mathematics, then in 1947 to King's College London where he graduated with a first class honours degree in Physics in 1950 and achieved a master's degree in 1952. He was awarded an 1851 Research Fellowship from the Royal Commission for the Exhibition of 1851, and studied for his doctorate in molecular physics under the supervision of Charles Coulson and Christopher Longuet-Higgins. He was awarded his PhD in 1954 for a thesis entitled 'Some problems in the theory of molecular vibrations'. He became a Senior Research Fellow at the University of Edinburgh during his time there (1954–56), then held various posts at Imperial College London and University College London where he also became a temporary lecturer in Mathematics. He returned to the University of Edinburgh in 1960 to take up the post of Lecturer at the Tait Institute of Mathematical Physics, allowing him to settle in the city he had enjoyed while hitchhiking to the Western Highlands as a student in 1949. He was promoted to Reader in 1970 and became a Fellow of the Royal Society of Edinburgh in 1983. Higgs was promoted to a personal chair of Theoretical Physics at Edinburgh in 1980. He was elected a Fellow of the Royal Society (FRS) in 1983, and was awarded the Rutherford Medal and Prize in 1984, and a Fellow of the Institute of Physics in 1991. He retired in 1996 and became Emeritus professor at the University of Edinburgh. Professor Higgs received an honorary degree from the University of Bristol in 1997. In 2008 he received an Honorary Fellowship from Swansea University for his work in particle physics. At Edinburgh Higgs first became interested in mass, developing the idea that particles – massless when the universe began – acquired mass a fraction of a second later as a result of interacting with a theoretical field (which became known as the Higgs field). Higgs postulated that this field permeates space, giving mass to all elementary subatomic particles that interact with it. The Higgs mechanism postulates the existence of the Higgs field which confers mass on quarks and leptons. However this causes only a tiny portion of the masses of other subatomic particles, such as protons and neutrons. In these, gluons that bind quarks together confer most of the particle mass. The original basis of Higgs' work came from the Japanese-born theorist and Nobel Prize laureate Yoichiro Nambu from the University of Chicago. Professor Nambu had proposed a theory known as spontaneous symmetry breaking based on what was known to happen in superconductivity in condensed matter; however, the theory predicted massless particles (the Goldstone's theorem), a clearly incorrect prediction. Higgs is reported to have developed the basic fundamentals of his theory after returning to his Edinburgh New Town apartment from a failed weekend camping trip to the Highlands,. He stated that there was no "eureka moment" in the development of the theory. He wrote a short paper exploiting a loophole in Goldstone's theorem (massless Goldstone particles need not occur when local symmetry is spontaneously broken in a relativistic theory) and published it in Physics Letters, a European physics journal edited at CERN, in Switzerland, in 1964. Higgs wrote a second paper describing a theoretical model (now called the Higgs mechanism), but the paper was rejected (the editors of Physics Letters judged it "of no obvious relevance to physics"). Higgs wrote an extra paragraph and sent his paper to Physical Review Letters, another leading physics journal, which published it later in 1964. This paper predicted a new massive spin-zero boson (now known as the Higgs Boson). Other physicists, Robert Brout and Francois Englert and Gerald Guralnik, C. R. Hagen and Tom Kibble had reached similar conclusions about the same time. In the published version Higgs quotes Brout and Englert and the third paper quotes the previous ones. The three papers written on this boson discovery by Higgs, Guralnik, Hagen, Kibble, Brout, and Englert were each recognized as milestone papers by Physical Review Letters 50th anniversary celebration. While each of these famous papers took similar approaches, the contributions and differences between the 1964 PRL symmetry breaking papers are noteworthy. The mechanism had been proposed in 1962 by Philip Anderson although he did not include a crucial relativistic model. On 4 July 2012, CERN announced the ATLAS and CMS experiments had seen strong indications for the presence of a new particle, which could be the Higgs boson, in the mass region around 126 gigaelectronvolts (GeV). Speaking at the seminar in Geneva, Higgs commented "It's really an incredible thing that it's happened in my lifetime." Ironically, this probable confirmation of the Higgs Boson was made at the same place where the editor of Physics Letters rejected Higgs' paper. Higgs was the recipient of the Edinburgh Award for 2011. He is the fifth person to receive the Award, which was established in 2007 by the City of Edinburgh Council to honour an outstanding individual who has made a positive impact on the city and gained national and international recognition for Edinburgh. Higgs was presented with an engraved Lord Provost of Edinburgh, in a ceremony held at the City Chambers on Friday 24 February 2012. The event also marked the unveiling of his handprints in the City Chambers quadrangle, where they had been engraved in Caithness stone alongside those of previous Edinburgh Award recipients. Prof Higgs was awarded with the Freedom of the City of Bristol in July 2013. In April 2014, he was also awarded the Freedom of the City of Newcastle upon Tyne. He was also honoured with a brass plaque installed on the Newcastle Quayside as part of the Newcastle Gateshead Initiative Local Heroes Walk of Fame. Higgs turned down a knighthood in 1999, but in 2012 he accepted membership of The Order of the Companion of Honour. A Guardian interview with the physicist later stated that he only accepted the order because he was wrongly assured that the award was the gift of the Queen alone. He also expressed cynicism towards the honours system, and the way the system "is used for political purposes by the government in power". The order confers no title or precedence, but recipients of the order are entitled to use the post-nominal letters CH. In the same interview he also stated that when people ask what the CH after his name stands for, he replies "it means I'm an honorary Swiss." He received the order from the Queen at an investiture at Holyrood House on 1 July 2014. 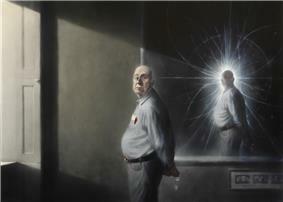 A portrait of Higgs was painted by Ken Currie in 2008. Commissioned by the University of Edinburgh, it was unveiled on 3 April 2009 and hangs in the entrance of the James Clerk Maxwell Building of the School of Physics and Astronomy and the School of Mathematics. Overbye, Dennis. A Pioneer as Elusive as His Particle, The New York Times website, 15 September 2014. Also published in print on 16 September 2014, on page D1 of the New York edition. ^ a b "Higgs boson-like particle discovery claimed at LHC". BBC. 4 July 2012. ^ "CERN Press Release: CERN experiments observe particle consistent with long-sought Higgs boson". Cdsweb.cern.ch. Retrieved 5 July 2012. ^ Pralavorio, Corinne (14 March 2013). "New results indicate that new particle is a Higgs boson". CERN. Retrieved 14 March 2013. ^ Naik, Gautam (14 March 2013). "New Data Boosts Case for Higgs Boson Find". ^ "Higgs boson breakthrough should earn physicist behind search Nobel Prize: Stephen Hawking". National Press. Retrieved 5 July 2012. ^ Stephen Hawking on Higgs: 'Discovery has lost me $100'. BBC. Retrieved 6 July 2012. ^ The London Gazette: (Supplement) no. 60367. p. 28. 29 December 2012. ^ Rincon, Paul (28 December 2012). "Peter Higgs: honour for physicist who proposed particle". BBC News website. Retrieved 29 December 2012. ^ "Prof Peter Higgs wins the Royal Society's Copley Medal". BBC News. 20 July 2015. Retrieved 22 July 2015. ^ a b c d e Sample, Ian. "The god of small things", The Guardian, 17 November 2007, weekend section. ^ Macdonald, Kenneth (10 April 2013) Peter Higgs: Behind the scenes at the Universe. BBC. ^ King's College London. "Professor Peter Higgs". Retrieved 8 October 2013. ^ Professor Peter Higgs broadcast footage. University of Edinburgh. 2012. Event occurs at 2:00. ^ "Swansea University Honorary Fellowship". Swansea University. Retrieved 20 December 2011. ^ "Higgs particle", Encyclopaedia Britannica, 2007. ^ Rajasekaran, G. (2012). "Standard model, Higgs Boson and what next?". Resonance 17 (10): 956–973. ^ "Meeting the Boson Man: Professor Peter Higgs". BBC News. 24 February 2012. ^ Higgs, P. W. (1964). "Broken symmetries, massless particles and gauge fields". Physics Letters 12 (2): 132–201. ^ Higgs, P. (1964). "Broken Symmetries and the Masses of Gauge Bosons". Physical Review Letters 13 (16): 508. ^ "Physical Review Letters – 50th Anniversary Milestone Papers". Prl.aps.org. Retrieved 5 July 2012. ^ Anderson, P. (1963). "Plasmons, Gauge Invariance, and Mass". Physical Review 130: 439. ^ "Higgs within reach". CERN. 4 July 2012. Retrieved 6 July 2012. ^ "The Edinburgh Award". The City of Edinburgh Council. Retrieved 3 July 2012. 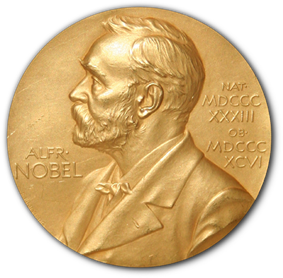 ^ "Acclaimed physicist presented with Edinburgh Award". The City of Edinburgh Council. 27 February 2012. Retrieved 3 July 2012. ^ a b They’ll find the God particle by summer.' And Peter Higgs should know"'". The Scotsman. 25 February 2012. Retrieved 3 July 2012. ^ "Higgs: Edinburgh Award is a great surprise". BBC. 24 February 2012. Retrieved 3 July 2012. ^ "Higgs Centre for Theoretical Physics". The University of Edinburgh. ^ "Prof Higgs: nice to be right about boson". The Guardian (London). 6 July 2012. Retrieved 6 July 2012. ^ "University to support new physics research". The University of Edinburgh. 6 July 2012. Retrieved 6 July 2012. ^ "Press release from Royal Swedish Academy of Sciences" (PDF). 8 October 2013. Retrieved 8 October 2013. ^ Boucle, Anna (18 Feb 2014). "The Life Scientific". BBC RADIO4. Retrieved 20 April 2015. ^ "Peter Higgs turned down knighthood from Tony Blair". The Scotsman. 16 October 2013. Retrieved 12 May 2014. ^ Rincon, Paul (29 December 2012). "Peter Higgs: honour for physicist who proposed particle". BBC News. Retrieved 12 May 2014. ^ a b Aitkenhead, Decca (6 December 2013). "'"Peter Higgs interview: 'I have this kind of underlying incompetence. The Guardian. Retrieved 12 May 2014. ^ Press Association (1 July 2014). "Physicist Higgs honoured by Queen". The Courier. ^ "St Andrews honours father of the Higgs Boson particle". University of St Andrews. 7 May 2014. Retrieved 9 June 2014. ^ "United legend to receive honorary degree". Retrieved 2 June 2015. 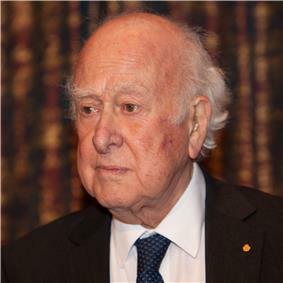 ^ "World renowned scientist Peter Higgs honoured by Queen’s University". Retrieved 15 July 2015. ^ a b "Portrait of Peter Higgs by Ken Currie, 2010". The Tait Institute. Retrieved 28 April 2011. ^ "Great minds meet at portrait unveiling". The University of Edinburgh. Retrieved 28 April 2011. ^ a b Highfield, Roger (7 April 2008). "Prof Peter Higgs profile". The Telegraph (London). Retrieved 16 May 2011. ^ Rodgers, Peter (1 September 2004). "The heart of the matter". The Independent (London). Retrieved 16 May 2011. ^ Sample, Ian (17 November 2007). "The god of small things". London: The Guardian. Retrieved 21 March 2013. The name has stuck, but makes Higgs wince and raises the hackles of other theorists. "I wish he hadn't done it," he says. "I have to explain to people it was a joke. I'm an atheist, but I have an uneasy feeling that playing around with names like that could be unnecessarily offensive to people who are religious." ^ Farndale, Nigel (29 December 2012). "Has Richard Dawkins found a worthy opponent at last?". The Daily Telegraph (London). ^ Key scientist sure "God particle" will be found soon Reuters news story. 7 April 2008. ^ Randerson, James (30 June 2008). "'"Father of the 'God Particle. The Guardian (London). ^ Baggot, Jim (2012). Higgs The invention and discovery of the 'God Particle' (First ed.). Fountaindale Public Library: Oxford University Press. pp. 90–91. Higgs married Jody Williamson, a fellow activist with the Campaign for Nuclear Disarmament in 1963. Their first son was born a few months after a visit to Chapel Hill for a sabbatical period at the University of North Carolina on August 1965. Higgs's family includes two sons — Chris, a computer scientist, and Jonny, a jazz musician. and two grandchildren; the entire family lives in Edinburgh. Higgs is an atheist. He has described Richard Dawkins as having adopted a "fundamentalist" view of non-atheists (although Higgs had said that Dawkins in a way is almost a fundamentalist himself). Higgs expressed later that he was displeased that the Higgs particle is nicknamed the "God particle", as he believes the term "might offend people who are religious". Usually this nickname for the Higgs boson is attributed to Leon Lederman, the author of the book The God Particle: If the Universe Is the Answer, What Is the Question?, but the name is the result of the insistence of Lederman's publisher: Lederman had originally intended to refer to it as the "goddamn particle". Higgs was actively involved in the Edinburgh University branch of the Association of University Teachers, through which he agitated for greater staff involvement in the management of the physics department. Higgs was awarded the 2004 Wolf Prize in Physics (sharing it with Brout and Englert), but he refused to fly to Jerusalem to receive the award because it was a state occasion attended by the then president of Israel, Moshe Katsav, and Higgs is opposed to Israel's actions in Palestine.